Just like every other aspect to a production, actors are instruments to be used at a director’s discretion, and they can be utilized in number of ways. In the case of Nicolas Cage, it usually takes an exceptional director that understands what he can bring to a film for Cage’s eccentricity and desire to take bold risks with his performances to be fully appreciated. Love him or hate him, I think we can all agree that Nicolas Cage brings an undeniably unique aspect (generally craziness and probably some yelling) to any role he takes, and it’s because of this that even his worst films have some level of intrigue to them. For ever handful of flops within his filmography, there’s a quality film, and within each Cagey masterpiece, I’d posit that his performance is integral to the film’s iconology. Here at Viddy Well, we’re unabashed Nicolas Cage fanatics, and since we’re still riding on high from the fumes of his performance in MANDY, we thought we’d share our 10 favorite Cage performances. Without further adieu, let’s unlock the cage and release this lovably quirky nutball! Cage plays Sailor Ripley, a romantic Southern outlaw of sorts, in this delirious David Lynch film. Sporting a rad snakeskin jacket, which symbolizes his “individuality” and “belief in personal freedom,” Cage gives a charmingly frenetic and furious performance that involves everything from singing Elvis to cracking skulls. Though not Lynch’s best film by a long shot, Cage gives the film the right kind of personality. This underrated Ridley Scott heist thriller exhibits Cage as a neurotic con man suffering from OCD, agoraphobia and germophobia. He’s nothing short of dazzling in his performance which features a myriad of stutters, spasms, and obscure rituals, in addition to a tic that causes him to yell “pixies” when surprised. Only Nicolas Cage is capable of this level of off the wall crazy, and he succeeds with flying colors. In addition to nailing the quirky side of the character, Cage also injects a healthy dose of pathos that shines through his relationship with his partner (played by Sam Rockwell) and his young daughter (Alison Lohman). MANDY gives us the latest and greatest in the ways of Cage performances. For the first half of the film, he is very subdued and understated before opening the floodgates on his rage in the film’s latter portion. Complete with an alcohol drenched bathroom freakout in tighty whities (which will no doubt be seen by most out of context on YouTube) and scenes involving snorting cocaine off of a broken shard of glass and lighting cigarettes off a flaming severed head, MANDY seems to have everything a fan of Cage’s more extreme roles could ask for. With Face/Off, Cage gives us amped up and exaggerated performance as Castor Troy that feels like a spiritual counterpart to his earlier film Vampire’s Kiss. His charged up attitude goes toe-to-toe with John Woo’s operatic direction, and it provides nice contrast once he and Travolta trade characters. This leads to some very interesting and memorable cat and mouse theatrics, as Cage is essentially embodying Travolta’s portrayal of Sean Archer. This is something that comes full circle when Cage’s Sean Archer must pass as Castor Troy. The only way Cage’s performance could be any better is if he were able to be Castor Troy for the entirety of the film — it doesn’t get much better than his priestly opening. This is Nicolas Cage’s personal favorite performance, and it’s one of ours as well. Vampire’s Kiss is a laboratory of various performative techniques that find their roots in silent era and German Expressionism. Cage gives a very physical performance here and is not afraid to swim in the deep end. As the character slowly begins losing his mind, Cage’s performance becomes more and more exaggerated, hunched, disheveled and deranged. Though many probably know the film as “the one where he recites the whole alphabet,” it really is a work of performative genius and one helluva enjoyable watch. Cage’s southern badass Cameron Poe may be one of his most quoted creations — everyone’s got their impersonation of the whole “Put... the bunny... back... in the box” bit. We love the hair, the weird accent, and the cheesy catch phrases. What makes this performance standout is how Cage interacts with the diverse cast of actors ranging from Ving Rhames to Steve Buscemi and John Cusack to John freaking Malkovich; they really give Cage a lot to work against. The other thing that’s great about this performance is how Cage clearly has tongue wedged firmly within cheek and embraces the absurdity of this 90s action with arms wide open. Leaving Las Vegas gives us a wild and alcoholic Cage. His performance is utterly believable, touching on an array of emotions and giving us those quality eccentric Cage moments while firmly setting roots into the reality of the drama. His performance here earned him an Oscar for Best Actor, and part of his success on this film was how much he dove head first into the role. For starters, he went on a drinking binge in Dublin and had a friend videotape him so he could replicate his speech and behavior. He also told GQ recently that he borrowed from several of the great alcoholic performances throughout cinema, particular Albert Finney in Under the Volcano, as well as hired a drinking coach that he could also borrow mannerisms and witticisms from. His work here is intensely raw and wholly captivating; there’s nothing flimsy about it. Adaptation gives us two Cages for the price of one and is probably the most technically challenging role that he’s ever undertaken throughout his lengthy career. Playing twins is no easy feat and Cage makes it look fun and easy. Cage gives each brother a distinct personality; with Charlie he’s a bumbling, sweating, awkward mess of self-doubt, devoid of the cartoonish quality that sometimes mars his performance, and with On the Donald he’s over-brimming with confidence and charisma. The dual-performances are seamlessly stitched together to make them even more believable, which required Cage to film the whole film as one character and interact with himself by listening back to the recording via headset. Cage fills out Adaptation with the complexity necessary to bring a Charlie Kaufman screenplay to life and is exceptional to watch. Cage perfectly fits the bill for the Coen Brothers’ cartoon vision of southwestern tackiness, and it’s where we always tell a Nicolas Cage skeptic to begin their journey of Cage appreciation. The quirky, over-acting cartoon Cage feels right at home in the world of the Coen Brothers, and it seems criminal that they haven’t collaborated on any films since. 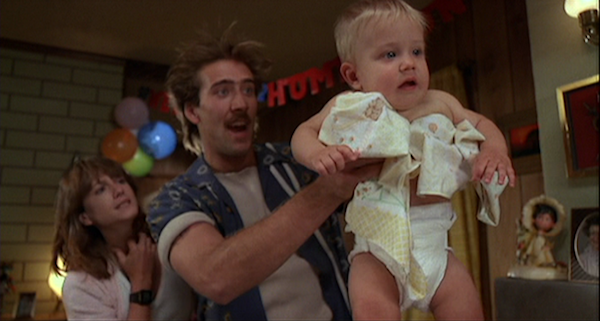 Out of all the Coen’s films, Raising Arizona remains one of their most beloved efforts, and Cage is a very big part of that. Cage’s Herbert I. “Hi” McDunnough is a faulty, yet endearing repeat offender who’s trying his best to go the way of the straight and narrow. Even more charming is he and Holly Hunter’s relationship and genuine desire to have a family. Raising Arizona gives us some Cageisms that can be enjoyed by the whole family, and though early in his career, his performance here is phenomenal and and all-out to joy to watch. Well, that’s our list? Did we leave off your favorite Nic Cage performance? We want to know. Share your thoughts and feelings in the comments section below, and as always, remember to viddy well!